Paramedics still reckon Indiana Stephens should be dead. The seven-year-old was sitting in the back seat of her family’s car when a truck ploughed into it at speed. 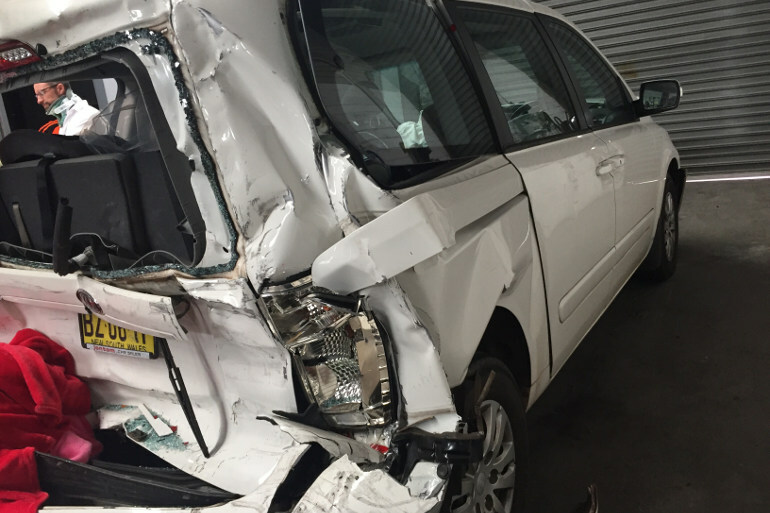 It left the back of the family’s Kia Carnival a mangled mess, trapping all three children inside as they travelled home with their parents from a funeral. Christine Stephens spoke to Mum Central about car safety and the seat that saved her daughter’s life. 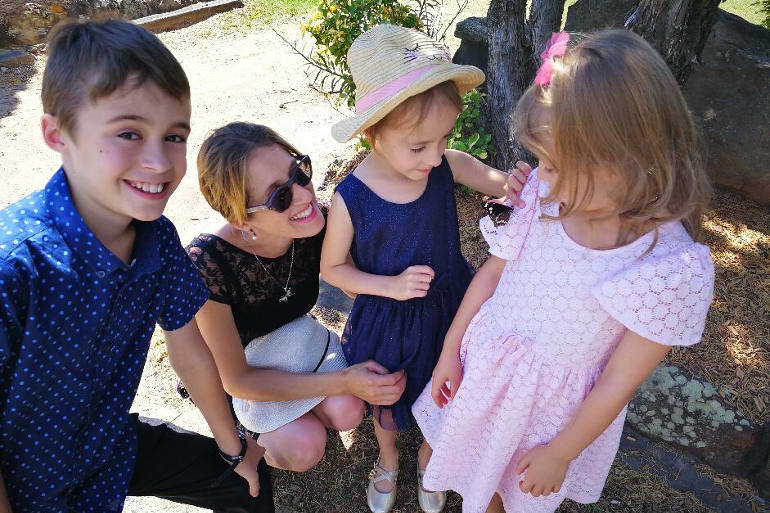 She was on the way home from her beloved grandmother’s funeral on 15 November, 2017, with husband Saxon and their three children when disaster struck. In a terrible twist, the accident happened the same day they lost their newborn daughter – a twin – six years before. The mum-of-three from New South Wales was asleep in the passenger seat at the time of the crash. She describes the moment she ‘awoke to a nightmare’ of petrol fumes and children screaming. “My door was the only one that could be opened. I somehow got out and realised there was a truck in our boot practically touching the girls car seats,” Christine says. “I started screaming and crying. A large truck had hit us travelling at around 80kms. He had not braked and there were no skid marks. Our car had actually nearly rolled onto the passenger side and then rectified itself. We have no idea how it didn’t roll. “Saxon was trying to get the kids out of the obstacle course which was now our car. Our fuel tank had ruptured and there was smoke coming from the car. “A stranger smashed Lucia’s window and tried to get her out. She thought he was trying to steal her from us,” Christina recalls. The whole family were taken by ambulance to Westmead Hospital. Miraculously, her 11-year-old son, Orlando was completely unharmed. Saxon suffered a broken wrist and other injuries. “The police, rescue, ambo’s, tow truck drivers, trauma teams told us we were all lucky to be alive. They said because our car was so solid and the kids were all restrained correctly we can tell our story. Our girls were found basically facing the roof as the rear of our car is gone,” Christine says. Those two daughters were luckiest of all, despite their injuries. Six-year-old Lucia suffered a sore neck, glass cuts, and seat belt burns and Indiana, 7, trauma to her head and spine. Though Christine says it could have been much, much worse. “If our daughter Indiana was not in a car seat, and the law says that she does not need to sit in a car seat, I think the reality is, she would be dead,” she tells Mum Central. “They worked out the velocity of the impact, because we were stationary and the truck was so big and travelling at 80km, the impact to our bodies was in excess of 100kms. So far this year 58 children have died on Australian roads, according to the National Road Safety Strategy. 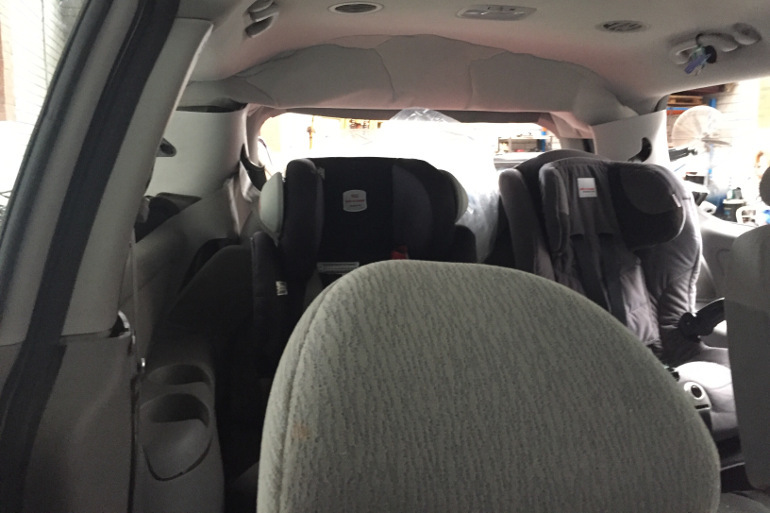 In the aftermath of her family’s accident, Christine wants to warn other parents about how tragic the situation could have been if the children had not been seated in child car seats. This is even though the girls did not have to be in car seats, according to current legal requirements for child car restraints in Australia. Although the National Child Restraint Guidelines from Kidsafe Australia recommend that children stay in a restraint for as long as they fit, Christine wants laws changed to compel parents to use child seats. “No primary school kid should be sat in the front seat of the car, but if you stand at the Drop and Go at any school, every second car has a child that is in the front seat or is in a booster seat and they’re way too little,” she says. For more advice on car seats take a look at the potentially fatal mistakes parents make. Before headrests were introduced in cars I felt sick in my stomach for hours after a Mum passed me with her kid standing in the back of a VW beetle, The kid was balancing across the front passenger seat reching either or something on the dash or in the glove bos. What’s mre she was going fairly fast around a blind bend right in the middle of the road. I dread to think what would have happened to that kid if the Mum had been forced to stop suddenly or swerve to miss an oncoming car. I still occasionally get nightmares about it.